I heard from some allegedly reputable folks that the rowing team is getting kicked out of the boathouse down by the Hawthorn Bridge ( nothing personal. Rents in the tdistrict are going through the roof and they can get more money for stuff other than skinny boats). I also heard that UP will finally put some of the ground near Pirate Town to use by building a boathouse there this summer. My question is, has anybody else heard about this? Yup, I've heard the same, but not the details. I bet Shadrach can fill us in....he always kept us up-to-date on the Etzel Field plans. This was on their fb page. Looked at that page. Clicked on the roster. There are 50 women on the rowing team? I had no idea. up7587 wrote: Looked at that page. Clicked on the roster. There are 50 women on the rowing team? I had no idea. Yeah, it's huge. And they are getting better every year. I expect good things at the WCC championship. Strangely, lots of Eastern schools are eliminating rowing. Temple had 100 women rowing and shut the sport down this year " for title IX reasons"
Really? You are trying to comply with title IX by shutting down a women's sport with 100 participants? Maybe they had too many women athletes? up7587 wrote: Maybe they had too many women athletes? But probably more about saving money. Face it though, if Temple, or any other school were to do the math, dropping football would technically save more money....but that sport also brings some prestige, and with it, "intangible" financial rewards. It is my recollection that golf was dropped and women's crew was started at UP primarily to more easily comply with Title IX. As Geez mentioned, the program is getting better and better as the coaches recruit rowers from high schools to upgrade a team that from its beginning has depended upon volunteers from the student body at large. I've only attended a couple of races, but have often observed and cheered on the various UP boats practicing on the Willamette. (You'd be amazed how one's voice can travel over the water to the extent you can carry on a conversation with the rowers as they ply the waters down to the Ross Island Bridge.) The rowers are without a doubt the most fun loving athletic team at UP....but they also work very hard! OK all you PN folks interested in UP's rowing team and what's happening with plans for a new boat dock, ramp, and boat house. Since DD called me out the other day I will report back soon with some current details. Please stay tuned! 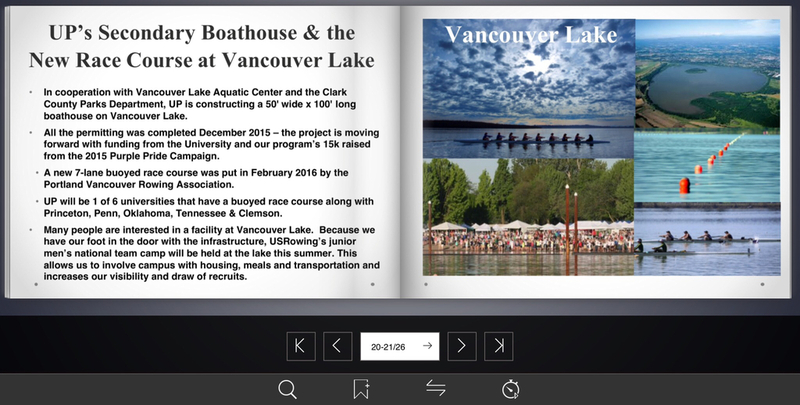 Shadrach wrote: OK all you PN folks interested in UP's rowing team and what's happening with plans for a new boat dock, ramp, and boat house. Since DD called me out the other day I will report back soon with some current details. Please stay tuned! Note the plural now in the thread title. 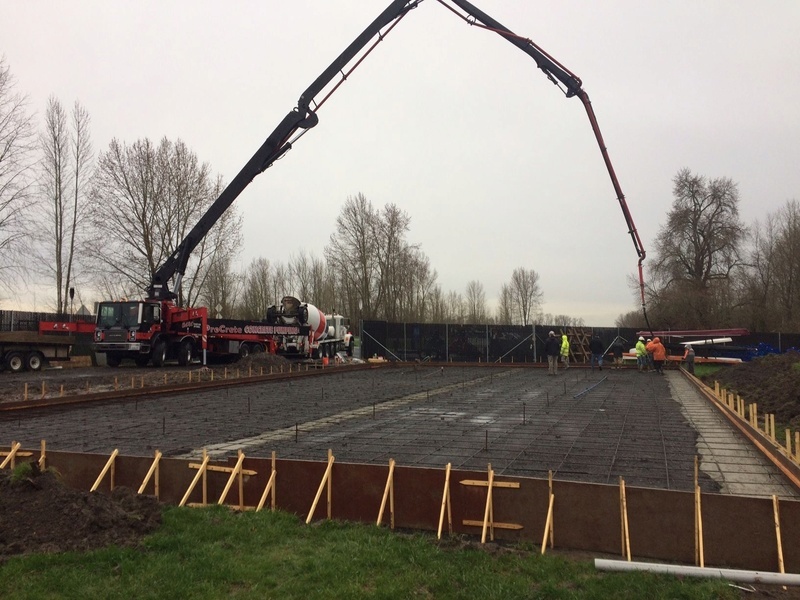 Apparently we have completed permitting and are going ahead with a 50x100 secondary boathouse on Vancouver lake in cooperation with Clark county parks, which will have a new buoyed course on the lake in time for the men's junior nationals this summer. Permits were approved in December. The buoyed race course and boathouse are HUGE steps forward for UP and Vancouver. Having the permitting done is also a big step, because I doubt we'll see the permitting for UP's primary boathouse until sometime in 2017 with a completion date no earlier than the fall/winter of 2017. 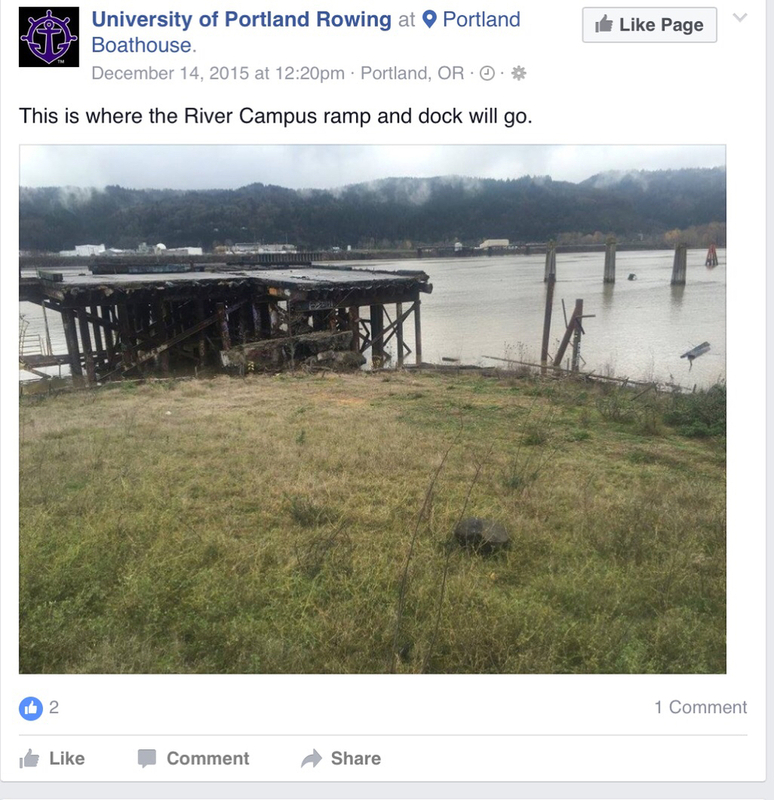 It is my understanding that once the permitting is done, the installation of pilings for the primary boathouse on the River Campus cannot begin until the Willamette is at its lowest level. Not knowing anything about such things, I would guess the river's low level mark is reached in late August....before the rain begins and after the snow melt ends. There will be two camps on Vancouver lake for men's sweep/sculling for the junior World Championships Aug 18-22 in Rotterdam. Here's the concept stuff for the River Campus Boathouse. I wonder where those trees will come from. Mrs. DD reminded me of this: in 2008 Vancouver Lake Crew's facilities on the east shore of Vancouver Lake were demolished by a tornado. DoubleDipper wrote: Mrs. DD reminded me of this: in 2008 Vancouver Lake Crew's facilities on the east shore of Vancouver Lake were demolished by a tornado. I'd be more worried about the much anticipated subduction earthquake and tsunami. Excited to have construction underway on new boathouse for rowing program at Vancouver Lake. Will be in place for next season. Okay. 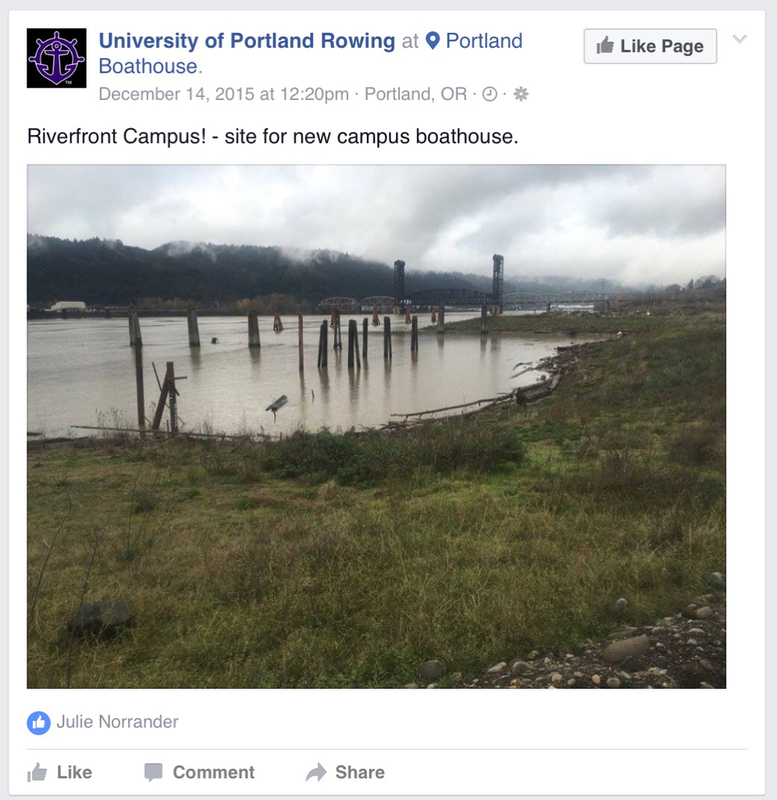 Now they have announced a campaign to build the boathouse on the river campus next to the main campus. Apprently, the team goal is to raise $25,000 by May 7th. That doesn't seem to be too hard. Spencer mentioned that we would be one of less than 5 schools in the nation to have their rowing facility on campus. If the dock has parking spots for Pilot Club members, that would be a selling point. A discussion last weekend revealed that the Pirate Town boathouse has been funded through a Franz gift and construction will commence in the summer of 2018. Design work is in process (or at least they are identifying a designer). The Vancouver lake boathouse has been completed. I provided input for a pub, but didn't get an adequate response. Also, the building of two soccer fields below the Bluff are in the permit process. Construction should begin soon. Geezaldinho wrote: Also, the building of two soccer fields below the Bluff are in the permit process. Construction should begin soon. I've heard construction of the two fields could begin as early as next month and that one pitch will be grass and the other artificial turf. The grass field will be for the soccer teams to practice on and the other field will be "multi-purpose" to include intramural sports. I don't know the time line, but the River Campus master plan currently calls for the near-term construction of a 400 meter track and a 6-court tennis center that will replace the current Louisiana Pacific Tennis Center. If they plan to build soccer practice fields down there do they have a desire to put something on top of the grass field and Pru Pitch? SouthCarolinaPilot wrote: If they plan to build soccer practice fields down there do they have a desire to put something on top of the grass field and Pru Pitch? Various intramural teams use the current fields next to Merlo well into the night (fortunately many/most of the homes on Willamette are now owned by UP), so the addition of the River Campus multi-purpose field is meant to take the strain off those venues. I don't have the current plan in front of me, but I believe the River Campus fields will eventually have lighting....but I need to check that. The addition of Schoenfeldt Hall and Fields Hall, the Beauchamp Recreational and Wellness Center, and Lund Family Hall were the latest steps in an attempt to keep up with the increased student body of 4,000. The next BIG step will be the ground breaking for the Dundon-Berchtold Institute academic center later this month....completion date optimistically targeted for January 2019! Both new river campus soccer fields will have lighting installed as part of project construction when the fields are built. UP agreed to a lights off time of 11:00pm as stated in its master plan and to satisfy concerns raised by neighbors who reside above the property along Willamette Lane. If the city moves quickly on UP's building permit application which is in for review right now there may be time (and enough good weather) to start and finish both fields. Otherwise one field (turf most likely) will be built and finished this year and the other (grass field) next spring. Phooey. I'm still waiting for the PilotNation boat dock, and then we can starting funding the MV PilotNation. I thought we were naming it the SouthCarolinaPilot Garage du Parking per my last post about the garage? Sidenote: people call them parking decks around here. Southerners.